Comments: (optional): Another horse tic from Welly & a PB by over 15cm! Awesome fish! Have to do quite a paddle to get em (normally at least) up here. Still never caught one. I have a spot down here where I can get the smaller specimens that is so close to shore I am still able to read the numberplate on my car. These ones are bit more of a paddle. Should load the yaks up & come fish down here with us sometime. Definitely my favourite eating fish! Bamalang wrote: Should load the yaks up & come fish down here with us sometime. Bamalang wrote: I have a spot down here where I can get the smaller specimens that is so close to shore I am still able to read the numberplate on my car. These ones are bit more of a paddle. Should load the yaks up & come fish down here with us sometime. Comments: (optional): Haven't seen one of these posted. We get them in Wellington mostly over winter and are a good fighting fish. They are related to Bluenose and are damn tasty They slime the absolute crap out of you though!! Never seen one of these on the forum before. What depth do you need to fish to catch one of them? They hang on the deeper reefs - the spearos get a heap off hunters bank down here. This one was out of a huge school that went from 5m at the top of the school to the bottom at 45m and took a couple of minutes to pass under me. By the time I dealt to him I couldn't find the school again as the current was honking. x2. Flippen beauty mate. Congrats!! 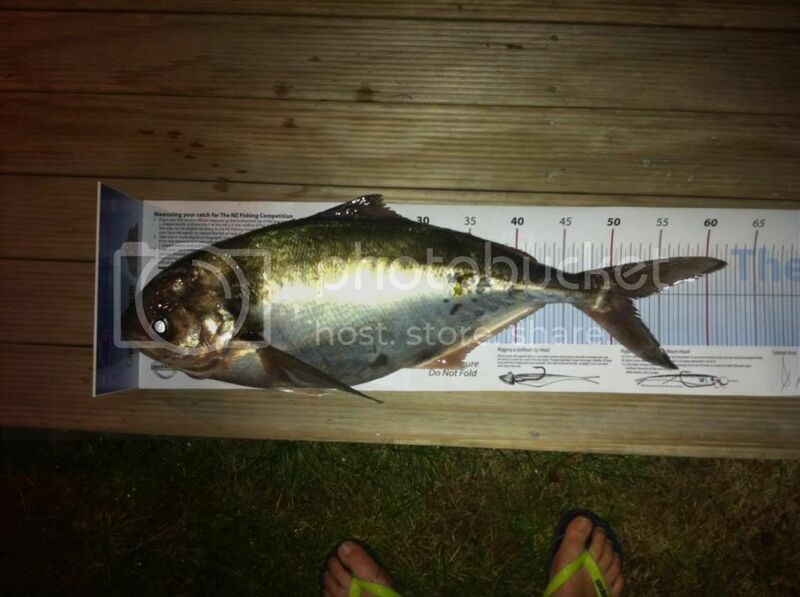 Have seen one landed of the Kapiti coast once, and do remember the fight it put up for a smaller fish. Very well done, and a very nice eating fish indeed. Already have my vote (unless something more exotic shows up). New PB for Snapper for me from the kayak. The fish was in very good condition and was returned to the tide. 85cm snapper returned to fight another day.